Julia Schmidt. Photo by Kristin Flory. As I have now been in Europe for a while, I have noticed quite a few differences. I do not feel like a typical American; in fact I am in the minority when I claim my pacifism beliefs and my worries about politics in the U.S. However, it is when I am far from the U.S. when I realize just how American I am. And so here we go, five ways you can tell I am an American. 2) The second obvious way to tell I am American is that I am not afraid of going outside with wet hair or flats without socks, even in the winter. I should first say, when I do these things in the winter, I am walking perhaps 100 feet outside from my dorm to the library. I know I will only be outside a few seconds and thus I am not worried about getting sick. However, Croatians look at me like I am crazy! Croatians, like a lot of Europeans, believe that by going outside with wet hair or not wearing enough clothes, you will get sick! And I think this is true of them. I believe that if you are worried or think you will get sick, you are more likely to do so. However, I just laugh it off and tell people I am American and thus will not get sick. 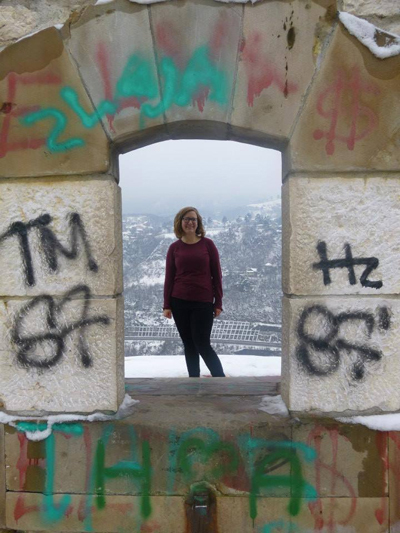 I doubt that I will ever wear as many layers or as heavy coats as Croatians… that just seems hot! 3) I think a lot about getting things done and being as productive as possible. This does not mean that I act in ways that are productive all of the time, but I feel like all my time should be spent doing things. Croatia is a relationship culture, meaning that spending time with people is more important than production. People regularly sit in coffee shops for hours over one drink just catching up with friends. They are not worried about what they have to do next or the fact that they are getting nothing “accomplished” during this time. Even in the work environment, I don’t see people as stressed as in America. Even though people want to get work done and done well, people still realize the value of genuine conversation and relationships. I admire this part of the culture so much and am trying hard to calm down and focus more on the relationships in my own life than worry about how productive I am being or should be. 4) I try to be as polite in any situation. I am not saying that Croatians are rude, but they can be blunt and they don’t believe in fake smiles. I was talking with one of my Croatian friends and she complained to me about the American fake smile, the one we give when we believe the other person is wrong, but we think it would be rude to say our opinion out loud. She hates this smile because you can see from a mile away that it is insincere. As an American, I have been trained to use this smile, believing that it is more important to be polite than sincere. Now, I see the problem with this. I am trying harder to not give this smile and more sincere. I don’t know think I will ever get rid of my extreme politeness, but I believe that Croatians are right not to beat around the bush and say things the way they are. 5) I do not use a multitude of emoticons. I am not saying this is a bad thing, but I have noticed when I receive a message from a Croatian friends, there are smiley faces after almost every sentence. In the U.S. we might use one smiley face every once in a while, but not nearly to the extreme that my non-American friends do. I asked a Croatian friend about this and she answered that they just want their writing to be more pretty. I respect that. And I have tried to use more just so I do not appear rude. These are just a few ways you can tell I am American. I am sure there are many more. To my Croatian friends, if you read this and think of other ways you can tell I’m American, please let me know! I find cultural differences extremely interesting. Find out more about Brethren Volunteer Service! Youth Peace Travel Team at Annual Conference 2014 in Columbus, Ohio. Photo by Regina Holmes. Y-P-double-T hits the big city! No, not Elgin or McPherson, but the bustling metropolis of Columbus, Ohio, to attend Annual Conference. 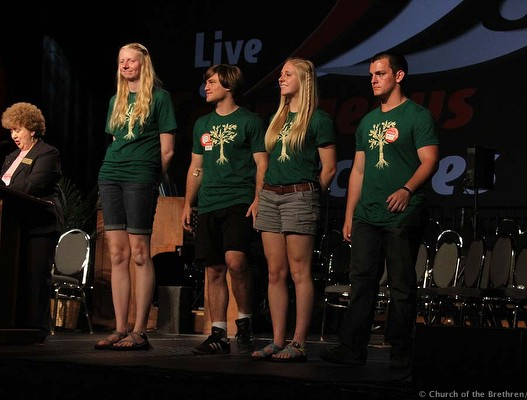 AC was a whole new animal for us – not only was the spacious conference center and comfortable hotel room a bit of a shock after 3 weeks of camp life, but the vast variety of ages and ideas gathered at conference challenged us as inclusive teachers of peace. While we typically give a team report of our week, conference proved to be a widely different experience for each of us. So, I will tell you of our tasks followed by my opinions of AC 2014, and then allow my teammates to contribute their own unique thoughts. 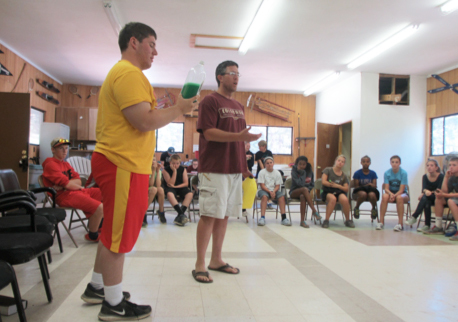 As is typical of a peace teamer’s summer, our tasks throughout the week varied greatly. 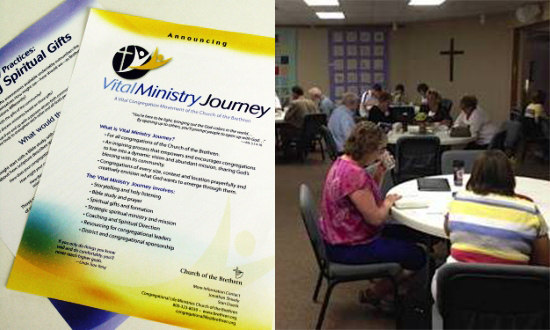 We were able to express our gratitude and give updates to each of our mentors and sponsoring organizations. 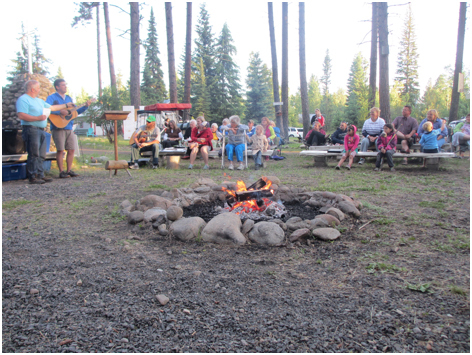 My favorite meal was the Outdoor Ministries Association lunch, as I felt at home among camp folk who sang proudly and had great things to say about each of the camps and staffs that we are visiting this summer. Hanging out with the youth for a day allowed us to introduce ourselves and teach some of our favorite aspects of just peace. 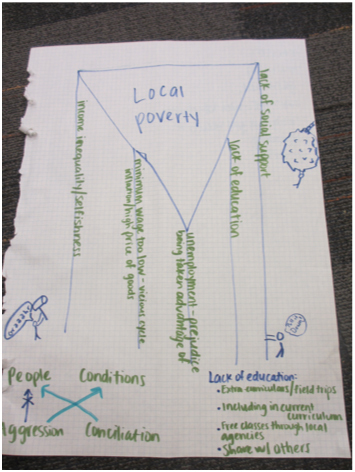 A huge highlight came for me when a student, who was initially reluctant to discuss social justice issues because they are “important but boring,” ended up enjoying our discussion and doodled symbols of the destruction of injustice, like wrecking balls against poverty and activist stick-people. Later that night, we got to lead songs at the youth’s “campfire”, which was difficult in the basement of a conference center. Although the fire was dead, the spirit of joyful singing was alive! We were lucky enough to spend an hour with our junior high friends, who brought refreshing energy to our Care for Creation activity. It was inspirational to share conversations with representatives from organizations such as On Earth Peace and Womaen’s Caucus. These moments allowed us to recharge our peacemaking batteries in the presence of those who are radical and affirming in their work and in their lives. Above all, I particularly enjoyed getting to meet and know the families of my fellow teammates, along with reconnecting with beloved members of my home church and beyond. This, believe it or not, was my very first Annual Conference, which gave me a unique and slightly critical perspective of the entire experience. Unfortunately, I was rather ill throughout the week, which meant that I was bed ridden more often than I was listening in on business sessions or hanging out in the exhibit hall. But of the events I was able to attend, I was mostly pleased. As a peacemaker, I was encouraged by those people and groups that called us to engage in conversation with those of different opinion than ourselves. For example, Bill Scheurer of On Earth Peace challenged us to record short conversations of our visions of peace with people that we may not normally approach. I was encouraged by the active listening that occurred during business sessions, interlaced with sporadic hymn-sings and blessings of those whose work we benefit from and deeply appreciate. This is not to say that there weren’t any frustrating aspects of the conference process and this conference in particular. Like many, I was disappointed by the outcome of the vote on the climate change paper. I recently finished reading Shane Claiborne and Chris Haw’s book “Jesus for President,” which has ignited a radical reformist spark inside of me that did not seem to be satisfied by conference. But, as Chris’s sister Elizabeth said, we are called to grow where we are planted, so I challenged myself to do just that. Overall, the immense support that was expressed to our team was overwhelming and humbling. So, thanks to our sponsors and our many supporters for a great conference, but mostly for sending us off on a wonderful journey and checking in with us along the way! Annual Conference was a wonderful experience this year as a member of the peace team. I was struck by the enormous quantity of people who showed up at conference that we had already met throughout this summer. It was an utter joy to see how many people we’ve already connected with—and we’re only halfway done! One of the biggest highlights for me came in the form of an insight session that my Granddad Crouse and I were asked to lead by On Earth Peace. We were to converse about his dreams and my visions of peace in this world. He shared stories upon stories such as defending his peace stance in Turkey and Ecuador as well as sharing his dreams for the multi-ethnic church he is helping plant in Florida. I spoke about being challenged by classmates in debate class about my peace stance, holding a peace event in the military community that I live in, and describing some peacemaking role models that I appreciate. The culmination of this experience for me happened more inside of myself rather than out loud. The last question on the list my Granddad and I created was, “How do you see your vision of peace coming to fruition in the world?” We didn’t get to this question because we had limited time, but my Granddad’s ending thoughts connected perfectly to my planned out answer. Before the session, I had reflected on this and came up with two words: awareness and intentionality. Awareness of the needs, feelings, and culture of those around us is vital to peace between individuals. Furthermore, using peaceful practices like I-statements and avoiding gossip takes intentionality and is not necessarily our instinct, but makes a huge difference in constructing positive relationships. So, at the end of the session, my Granddad spoke about the crisis with the kidnapped Nigerian girls and how he has been struggling with how he can act in response to the situation. He stated that after much thought, he had developed a plan for himself. This plan contained an extensive title and nine bullet points of action including 1. Taking at least five minutes per day to pray for the girls, their families, and the kidnappers. 2. Fast from (insert specific foods and such here) for a certain amount of time. The list went on. The last bullet, number nine, said Granddad was going to seek out Muslims in his community and develop friendships with them. This is when I began to cry. My Granddad, in number nine, expressed the desire to show acute awareness of the culture of those around him. His plan, nine specific actions, is literally the definition of intentionality. Basically, my Granddad was fulfilling my vision of peace right before my eyes. And he didn’t even know it. While this wasn’t my first Annual Conference, I only really have memories of one other. That one other conference was the 300th Anniversary conference in Richmond. For me the most impactful moments of my week came not from anything at conference itself, but from the people I had conversations with outside of sessions and the gym I had at my disposal in the hotel. Many of the people I talked with were old friends, some of which I hadn’t seen in years. Be them people I had worked at Camp Bethel with or gone to Christian Citizenship Seminar with, the ability to rekindle relationships was great. As silly as it sounds, the other aspect of our week at conference that really helped lift me up was having access to a gym. Be it this gym wasn’t exactly what I would pick (no squat rack equals a sad Jake) but it did give me an opportunity to finally lift semi-heavy things again. This was especially important for me on the Fourth of July. For those of you who don’t know, I am a Crossfitter. One aspect of Crossfit is the use of “Hero Workouts” to honor fallen police, firefighters, and military. Even as a pacifist this is an aspect of Crossfit that I have felt very passionate about the reason behind these workouts. These workouts are typically done on some sort of day of military recognition, such as Memorial Day or 9/11. The workouts done on these days are named after and done in honor of a particular person or persons that died in the line of duty. In the case of this Fourth of July I did the workout “Joshie” in honor of Army Staff Sergeant Joshua Whitaker, who was killed in Afghanistan on May 15th, 2007. This workout stuck out to me for two reasons. One, I had the equipment available to do the workout. Two, my sister is the same age as Joshua was. The thought of losing my sister helped me empathize just a fraction of what Joshua’s family must have felt. While I did this workout I didn’t play any music, and I didn’t have a workout partner. I used this time as a reflective time for myself and my life. “Hero Workouts” are made to be longer, harder, and more painful than normal Crossfit workouts. But the mindset, at least for me, while I do them is that that pain which I feel now is nothing compared to the sacrifices that the person which I am honoring had to endure. I don’t agree with Joshua that the way to solve the conflicts in Afghanistan are through military action. But, I respect him for having the courage to stand up for what he believed in, even at the risk of losing his own life. I appreciate the freedom that I have and recognize that that freedom is what Joshua died for. I think far too often in discussing peace or our opposition to war we fail to recognize the courage it takes to stand up for what you believe in. Yeah, it’s not necessarily the same things we believe in, I still think a certain level of respect and honor needs to be bestowed upon the members of our military. Service has many forms, just like peace and love do. Annual Conference was a struggle for me this year. I had experienced dissatisfaction at business before and I knew the worship messages were not what I was used to, but despite this knowledge it all managed to bother me again. It has been some time since I was at Annual Conference and I attempted to give more of myself in the process this time, to pay more attention to the goings on of the church and the message of each worship. But I still felt disappointed and disconnected. I wanted courageous leaders, people who weren’t afraid of the reaction of the denomination to their own personal beliefs, but need to share that real piece of them because that is what Jesus calls us to do. We need to be genuine and personable. We need to be open; peace and pacifism are not so limited in scope as to just being against war. Where I spent my personal time was also a struggle. My family all traveled to Columbus, Ohio for Annual Conference. Some came for different reasons than others but we all congregated with our church for the first time in two years. I felt truly blessed to have this opportunity to be doing work that I loved and also be able to visit with my family. I talked extensively with my brother, sisters, grandmother and mother. The Youth Peace Travel Team also got to meet my family and learn about the people that are the main players in my stories. I love the Youth Peace Travel Team, but it was a struggle balancing time with them, Annual Conference activities, and my family. Instead I just combined two of my favorite activities and asked the Peace Team to hang out with me and my family. I enjoyed the experiences of Annual Conference and felt blessed to have the opportunity with my family. It was an eerily turbulent flight into storms in Denver, but the YP-double-T landed safely and were happy to begin our week of work and fun at Camp Colorado. 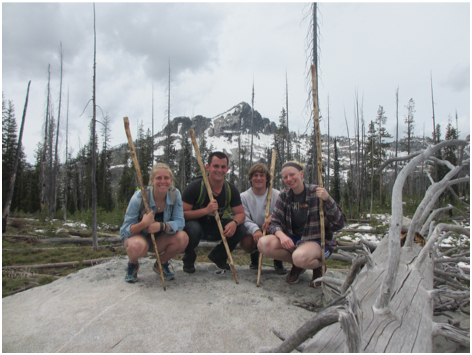 We were immediately enchanted by the rustic beauty of the camp and warmed by the welcomes of camp staff. (Unfortunately, their kind words didn’t do much to keep our toes warm at night – but their gracious gift of blankets did!). The week promised to be a change of pace, as we were going to be working with junior high campers and giving our five planned sessions their first go. But, after a week full of hiking to new heights, diving head-first into emotional depths, and taking a closer look at the gospel of peace, we can confidently report that this week made a difference. While we could immediately feel the breath-taking and lip-chapping effects of being 7500 feet above sea level, the true mountaintop experiences of the week revealed themselves more slowly. Some of us soared as our small group meetings invited and facilitated conversations surrounding the role of Jesus in our lives and His awesome healing powers. Some of us thrived when we went down to the river to play. And it’s safe to say that everyone, including the neighbors’ “polar bears” (giant flufftastic white dogs), smiled their way to the top of Russell’s Ridge, a beautiful hike and camp tradition. We were on top of the world as our staff and students displayed their creativity and goofiness during Thursday night’s talent show, as the gifted Jerry Bowen led us in meaningful and relevant spiritual exercises, as we were treated to musical and comedic performances as campers (and your very own YPTT) received mail, and as we gathered each morning in the warm sunshine and each evening around the blazing fire to pray together. As previously mentioned, this week was our first opportunity to teach the lessons we hope to teach many more times throughout the summer: Biblical foundations of peacemaking, bullying education, just peace, care for creation, and interpersonal conflict resolution. It took some late nights of planning and on-the-fly adjustments, but the interest and interaction of the campers energized us and reassured our excitement for the important work we are doing this summer. Highlights included our small group discussions about social justice issues and how to start tackling them together, an interactive game that encouraged passion and community organizing against a destructive corporation, and an uplifting affirmation activity to wrap up the week. We anticipate continuing to give our whole selves to this great teaching task as the weeks wear on, for the rewards are life-giving and fill up our cups. Although parts of the week were intentionally planned to allow both campers and staff to recall and wrestle with deep pain and sorrow in our lives, the healing of Christ and the support of the camp community trump the burdens we face and the bruises we endure. We have been climbing the mountain and have lost our breath a few times along the way, but we have new relationships and new perspectives to guide us for the rest of the journey. We are immensely thankful to have had another week of growth, learning, hospitality, and PEACE! Mountaintop experiences occurred frequently for me at Camp Colorado; the primary reason for this was the impact of God’s majestic creation, which always seems to touch me in the core of my being. The first experience of this was going to the river some miles away from the camp. Jamming out on the way through the mountains, then wading into the refreshing, chilly river stimulated my senses. Getting to know a new friend, hearing about their life in the middle of the beautiful rushing water, the background sounds of campers playing & splashing, surrounded by massive mountains with protruding boulders combined to make a stellar experience. Another night, Shelley & I slept under the stars, listening to Bon Iver & Jonsi as well as the forest sounds around us. I counted fifteen shooting stars before drifting to sleep. After hiking to Russell’s Ridge with the entire camp, I decided to run to the top by myself. Reaching the peak, exhausted & joyous, I sat on the rocks staring out over the mountainous expanse watching the sun melt over the trees. Amidst these exclusive encounters with God’s glorious nature, the underlying importance of it all was the connection felt by each member of the camp community. We bonded together over hikes, swims, & just simply looking around us. In our Care for Creation session, we agreed that Camp Colorado was a sacred space for us all thus deserving our ultimate care. 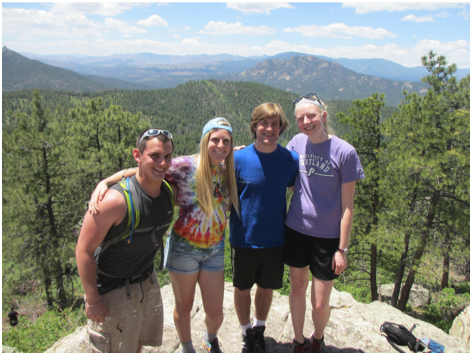 What special mountaintop experiences to be had on the Camp Colorado mountaintop! Youth Peace Travel Team 2014 at Camp Colorado. There were many mountaintop experiences while at Camp Colorado, some literally occurring while atop a mountain. The first I would classify as a not a single mountaintop, but a continuing experience. I would awake every morning and workout while at Camp Colorado. Upon finishing my post-workout shower, usually before many other people had woken up, I would go to the lodge and make a fire. These fires were a place where I often talked with the camp nurse Robert. Robert and I bonded while talking by these fires and became friends. Our friendship grew a bit though one night, once again involving fire. After a bit of rain had passed earlier that day I was asked to build the campfire for that night. After being unsuccessful for a while, who should show up but Robert. The two of us then proceeded to build a fire, despite all laws of fire building being noncompliant (dry pine needles, cardboard, and paper all not wanting to light for more than a split second). It was upon the creation of this particularly difficult fire that I can say that I really felt I was atop a mountain. We had earned that fire, a fire that we were able to share with an amazing group of junior high campers. The second experience I’d like to share is one that literally occurred while at the top of a mountain. While sitting on the mountaintop talking with one of the counselors, and accompanied by a dog-named BJ, I soaked in God’s beauty in many ways. The beauty of the view we had atop Russell’s Ridge, the beauty in the simplicity of the nature around me, the beauty in the meaningful conversation two people can share, and the beauty in the ways God guides our lives, even in ways that we don’t fully understand. 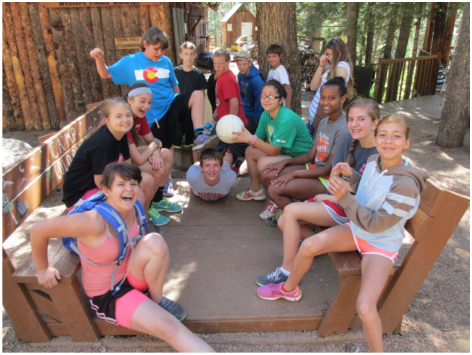 Camp Colorado overflowed with compassion, heart, and care for others. 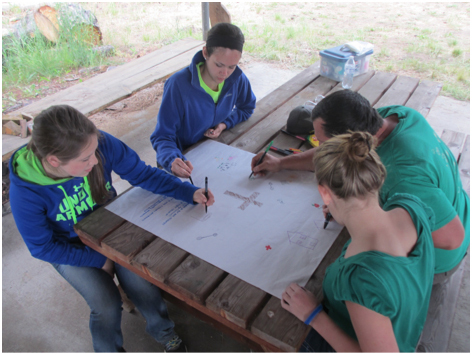 The staff’s passion for the sacred space of Camp Colorado was transparent in all their actions. During our last session this atmosphere of warmth was palpable. The Youth Peace Travel Team led the last hour-long session on Friday that taught about Interpersonal Conflict and how “I Feel” statements can be used to diffuse a situation. At the end of the session I led an activity that spoke to the caring and love we had found amongst the junior high campers of Camp Colorado. I have been a participant of this activity before, and I thought it would be fitting to include in our curriculum. The activity, named “Taps”, does not offer up a lesson, but rather conveys the power of others and their compliments. All involved are asked to sit in a circle facing outward with their eyes closed in a peaceful and relaxed mood. The group is then numbered off into three to five groups depending upon size. One group is called in to the middle of the circle and asked to tap those in the activity who they embody the statement read to them. I stood in the middle reading statements: “Tap someone you have laughed with,” “Tap someone who is powerful,” “Tap someone who helped you heal,” “Tap someone who surprised you.” After each statement is read the people involved are given a minute or so to tap someone. I was surprised by the whole camp and the willingness of the campers to engage in an activity as giving as this one. Campers and staffers blew me away with their compassion for one another. They all had truly bonded over this one week of camp. Some members of the circle cried and some smiled but they all enjoyed the positive energy that was suspended about the room. And I believe it is created not by the activity, but the people involved, the power of that intimate silence shared by ones who love each other. I am grateful for the chance to be at Camp Colorado and to share this moment with such beautiful people. The best part about Taps is that it doesn’t matter who taps you, you are amazing, awesome, bold, original and unique regardless, the compliment is still the same.